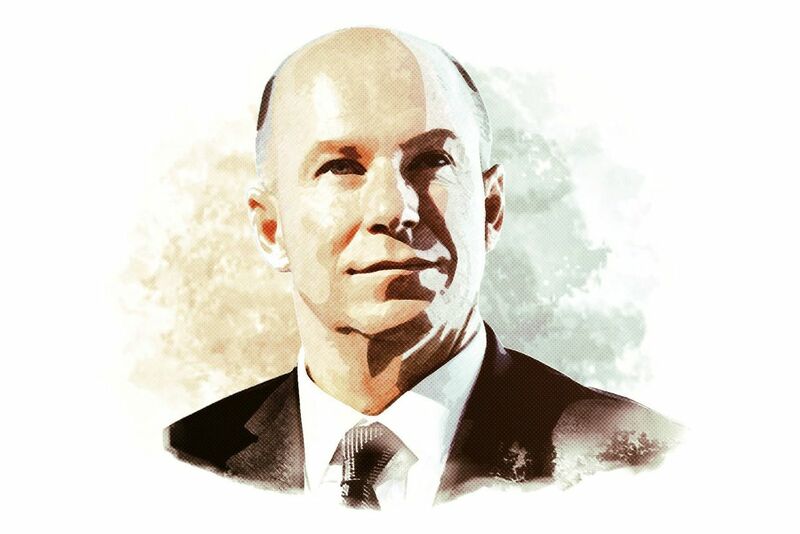 Photo illustration of Bombardier CEO Alain Bellemare. Alain Bellemare jumps onto a makeshift stage in a darkened hangar at Bombardier Inc.’s Mirabel, Que., aircraft assembly site to the crashing guitars and drums of Van Halen’s hard-rock hit Panama. It’s early afternoon in the midst of a heat wave gripping Eastern Canada, and Bombardier’s chief executive is wearing a microphone headset and open-collared white shirt for the event, a ceremony with employees to celebrate the official transfer of Bombardier’s flagship airliner, the C Series, to Airbus SE. Purple lights swirl overhead as the fit, compact executive starts talking about the historic partnership between the two companies and how it gives the fledgling C Series a chance to reach its full potential. Between gulps of water, he thanks the Quebec and federal governments for backing the project, then beckons Airbus head Tom Enders to join him on stage, giving him a sweaty hug. “It’s a bit of an emotional moment,” Mr. Bellemare says, adding he’s proud to see some 2,000 Bombardier employees now working for Airbus. With the handover to Airbus on July 1, Bombardier has freed itself from operational responsibility for the aircraft – ie., selling it and building it – after US$6-billion in development costs almost sank the company and left it awash in debt. Bombardier remains a minority partner, earning a portion of the revenue from sales and retaining a 34-per-cent ownership stake in the project. And Mr. Bellemare checks off another box in his master plan to turn around one of Canada’s major industrial manufacturers. Now halfway into that five-year plan, Mr. Bellemare is beginning to hit his marks. Job one was to ensure the company raised enough cash to keep worries about its solvency at bay. With that accomplished, the odds are rising that Bombardier will manage to hit two ambitious financial targets he set out in 2015, observers say: free cash flow of US$750-million and EBITDA of US$2.25-billion on revenue of US$20-billion by 2020. Cash flow in the fourth quarter hit its highest level in seven years, and the balance sheet continues to improve, bolstered recently by proceeds from the US$635-million sale of Bombardier’s Downsview property in Toronto and a US$500-million share issue. Investor confidence in management also seems to have returned, underlined by the fact Mr. Bellemare’s team has beaten analysts’ forecasts for pre-tax earnings for all nine quarters since taking over. There’s still much work to do to regain profitability and whittle down the almost US$9-billion in debt. There’s even more to rebuild the company’s relationship with the general public. Bombardier’s image has been bruised by a number of public-relations disasters: A bungled contract to supply streetcars to Toronto’s transit service; a controversy in 2017 over pay increases given to top executives, not long after the company accepted billions in assistance from various arms of the Quebec government; ethical stumbles in its rail operations overseas. But right now, investors are looking past all those headlines and riding a roughly 100-per-cent gain in Bombardier stock since the day Mr. Bellemare was appointed. The shares are on pace for their biggest annual price increase in almost three decades, according to Bloomberg data. The company is playing offence as it starts to reap the fruit of years of product development. And as luxury jet sales rebound and the Airbus partnership pays early dividends with new orders, many believe the rally has just begun. With a solid body of work upon which to judge his performance, the CEO spoke with The Globe and Mail this month – his first lengthy sit-down with a media outlet since taking the helm three years ago. Over 90 minutes, he described what was happening behind the scenes as he brought the company back from the brink. And he addressed the toll it took on him, both physically and emotionally. Alain Bellemare came to Bombardier after a senior-level shakeup in late 2014 at United Technologies Corp., the U.S. conglomerate that makes Otis elevators, Carrier air-conditioning units and Pratt & Whitney aircraft engines. It happened fast. And it wasn’t particularly pretty. Louis Chênevert, a fellow Quebecker who was UTC’s chief executive at the time, was ousted over concerns that he was devoting too much attention to his private interests, including a new 110-foot luxury yacht. He’d been somewhat of a mentor to Mr. Bellemare, a trained mechanical and aerospace engineer. And with Mr. Chênevert gone, things changed quickly. Three executives had been groomed as his possible successors, including Mr. Bellemare, who was head of UTC’s US$30-billion aerospace operations. The board chose chief financial officer Greg Hayes instead, believing he might have a better handle on the overall company. Mr. Bellemare, not content to play second fiddle, began to look for other opportunities. Word had barely got out that he was leaving UTC when he got a phone call from Bombardier’s then-chief executive and current chairman, Pierre Beaudoin. It’s hard to overstate the difficulty Bombardier was in when it hired him as CEO in February, 2015. The company had just suspended development of its new Learjet85 business aircraft, laid off 1,000 employees and revised its earnings and cash flow guidance downward for 2014. Luxury jet sales were still stuck in a trough. The train business was having trouble executing, notably on several big contracts in Europe. At the same time, Chinese rival CRRC Corp. was emerging to challenge Western train makers in Asia and beyond, putting tremendous pressure on Bombardier’s rail business to become more efficient. And the company was burning up cash fast as it tried to bring two new aircraft to market – the C Series and the Global 7000 business jet, since renamed the 7500. 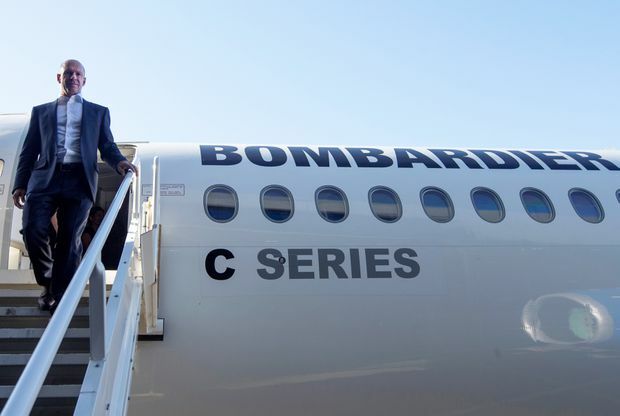 Bellemare walks off a C Series plane at Bombardier's plant in Mirabel, Que., in 2017. Bombardier is controlled by the founding Bombardier-Beaudoin family, and the concern investors had from day one was whether Mr. Bellemare would be given the leeway to implement his own fixes without interference from the owners. The last outsider, Paul Tellier, stepped down a year before the end of his contract after a boardroom brawl over strategy that saw two independent directors also quit. Those worries, it seems, were overblown. Over the next several months, Mr. Bellemare put in place his five-year blueprint to turn the company around with the full support of Mr. Beaudoin and the rest of the board. Insiders say the two men even socialize and exercise together on occasion, talking business while spinning in spandex. Step one of the transformation was to assemble an all-new executive team. Mr. Bellemare recruited the best people he could, including industry veterans such as Fred Cromer and David Coleal. Together with CFO John Di Bert, they set out to do multiple reviews, crunching numbers and “probably running over a thousand scenarios” to build the basis of that five-year plan, which was presented to investors in November, 2015. In the meantime, they were also talking to prospective customers and trying to find a long-term strategic partner for the C Series. Their first series of talks with Airbus broke off after Mr. Enders vetoed the deal. Airbus liked the technologically advanced C Series as a potential small-product offering, below its own A320. But regulators had not yet certified the Bombardier aircraft and it was not yet flying commercially, making it a risky, unproven proposition, especially as Airbus grappled with the production start of its bigger A350 aircraft. When he started to implement the plan, sleep came more easily but things remained harried. The C Series and Global 7000 were sucking massive amounts of cash every quarter, and the CEO had to make sure Bombardier had enough money to get the planes past testing and certification and into service. Quebec stepped in with a US$1-billion lifeline for the C Series, becoming an investor in the program. Then Bombardier held an auction for a minority stake in its train business, raising another US$1.5-billion from the Caisse de dépôt et placement du Québec. A bond sale and equity issue completed the financing picture. I kind of knew that I was coming into a significant challenge. That’s the reason why I took it. You would say, ‘This guy is crazy.’ I am a little bit crazy. You know, I thrive on challenges. Mr. Bellemare reset the production rates for Bombardier’s luxury aircraft as the market remained soft. He subsequently negotiated a further $372-million in federal aid. Internally, he also changed the reporting culture. He tightened the leash on his business units so that they reported every two to three weeks instead of the typical three months. And he challenged them to get better. “People were afraid of Alain,” said another. “From day one, it was very confrontational. Nothing was good” for him. Just how close Bombardier came to bankruptcy protection remains a closely guarded secret, but Mr. Bellemare says that avenue was never explored for one main reason: Starting down that path would have made it difficult to get off. “I think it could become a self-fulfiling prophecy,” he said. During that time, the Bombardier rivals Boeing Co. and Airbus were eagerly pushing the narrative of a company on the verge of death, according to industry sources. And Mr. Bellemare was the one fielding calls from anxious clients. But it wasn’t enough to calm the market’s restlessness over Bombardier’s future. Behind the scenes, the company continued to have trouble selling the C Series, and Mr. Bellemare needed a permanent solution to ensure the viability of the program. He’d concluded the moment he saw Bombardier’s books that the company had to have a strategic partner for the plane. Bombardier approached Boeing to do a deal. But then, perhaps sensing an opportunity to deliver a crushing blow to a desperate company, the Chicago-based plane maker sued Bombardier under U.S. trade laws in April, 2017, in a bid to keep the C Series out of the U.S. market, alleging it used unfair subsidies to sell the plane at “absurdly low” prices. The relationship quickly turned adversarial. The top U.S. trade agency ruled in Bombardier’s favour this January. Executives with Bombardier and Airbus celebrated the win with champagne and tweeted out a photo. Bombardier also explored a partnership with several Chinese state-owned enterprises, including Commercial Aircraft Corporation of China, according to sources. But Ottawa was not keen on a deal between the Canadian firm and a Chinese partner, so federal officials made their views known and facilitated a rekindling of discussions with Airbus, which led to an agreement last October. 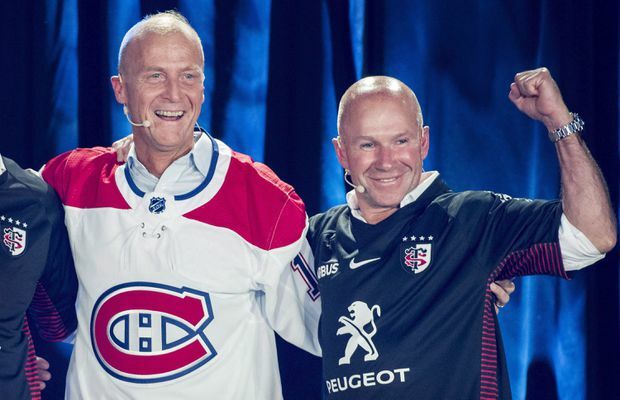 Airbus CEO Tom Enders, left, and Bellemare wear jerseys from the Montreal Canadiens and Stade Toulousain during an event at Bombardier's assembly plant in Mirabel, Que., earlier this month. Other elements of Mr. Bellemare’s plan are, by now, relatively well-known. They include drastically reshaping the train business by cutting thousands of jobs at various assembly facilities – after arduous negotiations with unions in Europe – and improving contract execution while booking more projects that use existing designs. As for the luxury jet franchise, the Global 7500’s scheduled entry into service later this year, combined with sales of smaller Challenger and Learjet models, will make up three-quarters of a planned US$4-billion increase in revenue over the next three years. For that revenue gain to happen, though, sales of private jets have to rebound in a sustained way following the pickup in activity this year. The depth of the softness in the market is one of two things that Mr. Bellemare says he did not see coming. (The other is the Boeing lawsuit). He acknowledges that the historical correlation between U.S. corporate profits in particular and luxury jet deliveries appears to be cracked. “When you look at this and the Dow, you know, moving to 25,000 points [in January], we should have been selling business aircraft like crazy,” he said, adding that the perception of private, luxury aircraft as wasteful lingers in some corners of the world. Mr. Bellemare comes across as an intense guy, with a high-volume way of speaking that leaves little room for nuance. Those who know him say that vigour cuts across everything he does. “Alain does nothing half-heartedly,” said Montreal executive Jean-Luc Breton, who knows Mr. Bellemare from his days at Kraft Foods Group Inc.
Up most mornings by 6 a.m., he starts every day by exercising at least 45 minutes. Running, cycling, weights, “whatever I can do that morning that makes sense,” he said. Then he does a mental roundup of current events on the all-news channels. “CNN, you know, CNBC. I do Bloomberg. I do BNN. And then I do the French channels.” On the way to work from his home on Nun’s Island, he tackles the print-media news summaries. At 57, you get the sense that exercise and proper diet are not optional for him. They’re the key to his stamina, and he takes them very seriously. Nobody is laughing, though, at what Mr. Bellemare has been able to do with Bombardier. I’m very focused, very disciplined. I’m very demanding. I’m very results-focused. I’m also very sensitive and I work very closely with my team. Of the 22 analysts who follow the company and are included in Bloomberg’s consensus, 17 had buy ratings as of June 28 – the highest number in five years. None had sell ratings. Several have recently raised their price targets. Not everyone is a believer, of course. Rob Medd of Bucephalus Research has compiled a bear case against Bombardier, arguing that while the company’s EBITDA is expected to rise by US$1-billion, up 100 per cent, over the next three years, it has spent and borrowed a lot to get to where it is today, leaving little cash for shareholders. Bombardier dismisses Bucephalus as a “fringe” outfit that is disconnected from its business reality, noting it is not part of the Bloomberg analyst consensus. Among the institutional investors adding to their positions in Bombardier is ValueWorks LLC, a New York-based investment management firm. Founder Charles Lemonides says the firm invested based on the strength of Bombardier’s product franchises more than the capabilities of any senior executive. That might be selling Mr. Bellemare short. Michael Sabia, chief executive of the Caisse, praised the CEO’s big-picture thinking at an event just after the Airbus deal was announced, saying it’s rare to solve several problems with a single transaction. In addition to securing the viability of the C Series – since renamed the A220-300 – the Airbus partnership offers a way to build it in the United States, bypassing any import duties. Calin Rovinescu, Air Canada’s chief executive, says the speed with which Mr. Bellemare has engineered change against historical odds should not be overlooked either. Such turnarounds often come at a personal cost to an executive, and this one is no exception. Mr. Bellemare, the father of two grown boys, struggled to keep his marriage intact. He intends on staying on as CEO after his turnaround plan has run its course if the board gives him a mandate. “My life has changed. I want to be here,” he said. “I’m happy. I like what I’m doing. “And I’m not just a Mr. Fix It,” he said, adding that running a healthy company in growth mode, which he expects Bombardier to become, is closer to what he’s used to doing. He cut his teeth running operations for the Canadian arms of Crown Cork & Seal and Kraft before joining Pratt & Whitney Canada in 1996 as vice-president of manufacturing. He became president six years later, leading the company through a 45-per-cent drop in production after the Sept. 11 terrorist attacks before heading to UTC in the United States. There, his big coup was directing the US$18-billion acquisition of North Carolina’s Goodrich Corp.
There’s much more work to be done, he says, including building Bombardier’s reputation in Canada ahead of a recruiting drive in the months and years ahead. “By and large, we are definitely regaining credibility now with the street, with customers and with employees,” Mr. Bellemare said. “With the population at large, I think that there is still a significant gap, a perception gap” based on a view of the company as a troubled manufacturer dependent on public money. There’s only one way for Bombardier to start improving that perception, he says, and that is to perform. He acknowledges that there are fences to mend in Toronto, in particular, where the company has had difficulty delivering new streetcars. And he urges Canadians to look at the government loans and subsidies given to aerospace firms in other countries, calling it “an irritant” that many people think Bombardier is exceptional in that regard. But mostly, as Bombardier continues to find itself in the middle of Canadian battles over pipelines and public aid, he just wants Canadians to be open to his view that the company is a boon for the country, not a drain. Bombardier has invested $10-billion over the past several years in engineering and development spending, he says, the vast majority of it in Canada. Employing people who pay taxes. Developing intellectual property that is the envy of the world. from the business to US$8.5-billion by 2020.